0201.3.1 Purpose - Write to describe, entertain, and inform. Various Styles - Write in response to literature (e.g., create a new ending to a story, create class books, summarize a story), compose a variety of written works (e.g., friendly letters, journal entries, reports, experience stories) and begin to compose narratives (with a beginning, middle, and end). Brainstorm Ideas - Brainstorm ideas with teachers and peers, use graphic organizers (e.g., webs, charts, Venn diagrams) independently and/or in group, and use a variety of resources to gather information. 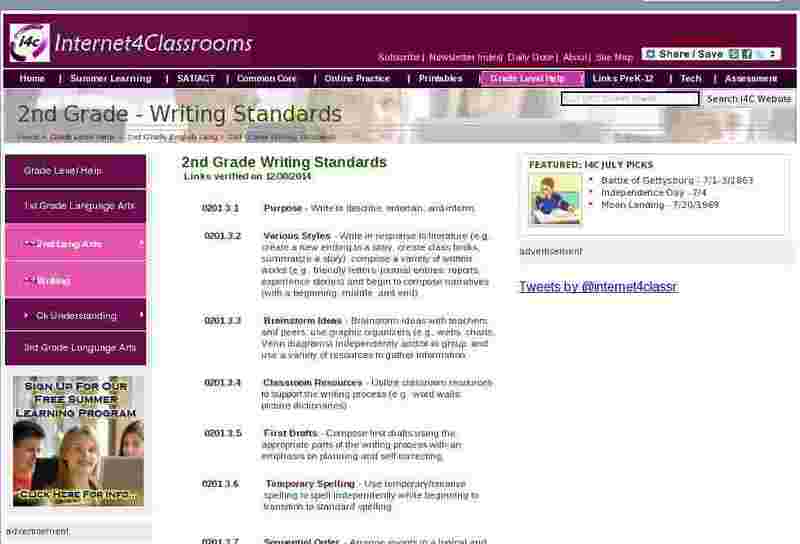 Classroom Resources - Utilize classroom resources to support the writing process (e.g., word walls, picture dictionaries). First Drafts - Compose first drafts using the appropriate parts of the writing process with an emphasis on planning and self correcting. Temporary Spelling - Use temporary/creative spelling to spell independently while beginning to transition to standard spelling. 0201.3.7 Sequential Order - Arrange events in a logical and sequential order when writing. 0201.3.8 Descriptive Words - Continue to add descriptive words and details to writing. 0201.3.9 Write Clearly - Create legible documents for reading by forming legible lower case letters utilizing correct spacing and by writing from left to write and top to bottom. 0201.3.10 Evaluate - Evaluate own and others' writing through small group discussion and shared work. 0201.3.11 Use Suggestions - Incorporate suggestions from teachers and peers. 0201.3.12 Rubric - Use a simple rubric to evaluate writing. 0201.3.13 Illustrations - Incorporate photographs or illustrations in written work.